The optical trigger and the Nikon CLS both require the slaves to be in the line of sight of the master. Sync cable does not have that requirement but it is not very flexible. The next method is to use wireless trigger. I got this wireless trigger on eBay for less than $20. It's brand is Jianisi or JN and it's model number is PT-04TM. It is an OK trigger, when it works. The reason I said that is because something it does not trigger and I need to "reset" it by switch the channels and the on-off switch. 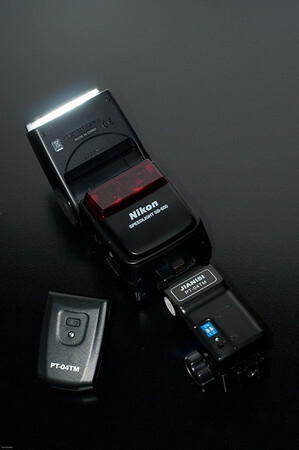 Another thing that I don't like is the receiver is too long if I mount the flash on the hotshoe. It does not feel that stable when mount the setup on a lightstand with an umbrella. I can use the sync port but then there is no way to place the receiver on the stand. Sometimes it does not work. Need to be "reset"